Passage of the Kissing People from 74th Street. 74th Street Productions announces the publication of a new novel by Seattle author, Peter Kahle. 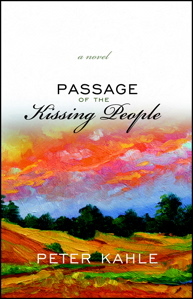 PASSAGE OF THE KISSING PEOPLE is a lyrical tale of memory, in which a Seattle artist’s past leads to a romantic mystery in his present. The setting for this coming of age novel is Sonoma and Seattle and back again. The story explores the friendship, trials and dark secrets of two young families just after WWII. Life unfolds for young Michael and his sister on the grounds of the Sonoma State Home for the Feeble Minded (as it was sadly called in the 1950s) where their parents are on staff. When the family must flee the Sonoma Valley due to sickness, a mysterious suicide, and the political warfare raging at the Home, seven year old Michael steals the Kissing People, an Italian silver brooch, an antique icon thought to bring luck to the family that owns it. It’s stolen, then lost in a fierce storm. As an adult an anonymous email challenges Michael to return to Sonoma, reconstruct his life, and gain forgiveness for himself and his dying father. He must find the long-lost Kissing People. Kahle is the author of three other books, two for middle grade readers “Shakespeare’s A Midsummer Night’s Dream: A prose narrative”, “Shakespeare’s The Tempest: A prose narrative”, as well as “Naked at the Podium: A Writer’s Guide to Successful Readings.” “Passage of the Kissing People” is his first novel.